For most of us, our Christmas traditions are ingrained. In particular, the way in which we decorate the house isn’t questioned. You will know months in advance whether you plan to have a real or artificial tree, how the cards will be hung and what additional ornamentation your house (and possibly your garden) will wear for the festive season. There are however certain “life changing events” (a technical term from my place of work!) that may have an impact on Christmas decorations. Whilst Christmas may be primarily for children, puppies have to be thought about more than normal at this time of year. For his first Christmas with you there are many dangers for your puppy that you have to keep him away from, but I will concentrate on the vegetative ones here. The first thought is that a dog puppy might be tempted to lift his leg against the tree since that is what he is probably starting to get used to outdoors (depending on quite how young he is). Assuming that the trunk is not too exposed, this may not be too much of a problem since the branches will protect it, although presents may be a different proposition. Far more likely is that your tree will be placed in a strategic corner and your puppy will want to investigate behind the tree and will probably knock the decorations off either in his forward or backward journey (assuming there isn’t room for him to turn around). This is not a good experience for either you or him when you want your tree to stay looking at its best, so it is probably a good idea to ensure that this cannot happen. I have to admit that over the years, I have found that it is much safer not to have a tree indoors, but that may be a solution that many find hard to tolerate. Maybe you could surround your tree with puppy panels to keep the puppy away from it, removing them during the present opening festivities? The other key issue to be aware of is the possibility of dropped berries. If, like me, you like holly as a decoration, then toward the end of the holiday period after the sprig has been kept in the realtively hot and dry environment of a house can cause the berries to drop to the ground. Holly berries can cause stomach upsets amongst other things, so please keep a vigilant eye for berries. More worrying, for those that can get hold of it, is Mistletoe. According to the Dog’s Trust list of poisonous plants, just a few berries can be fatal for a puppy. Maybe we should be glad that it has become less common in homes over the years. This isn’t technically Anya’s first Christmas with us but she was a month old last year and as such, she was securely protected along with the rest of the litter for any Christmas dangers. This year is rather different. Thank goodness she has just about learnt what she is and is not allowed to play with in normal life. Now our Xmas challenge begins. I usually put the cards up the weekend before the holidays. They go around the (unlit) fireplace, so she will be able to easily reach them. In a few days we will therefore have to start teaching her that they are not toys for her amusement. We never leave her loose in the house unattended, so should be available to reinforce the message. Luckily we have older dogs who should also be able to explain Christmas etiquette to her. There will be no Christmas tree to tempt her and the Scandianvian lights are in the dining room. the door of which is always kept closed when she is loose. 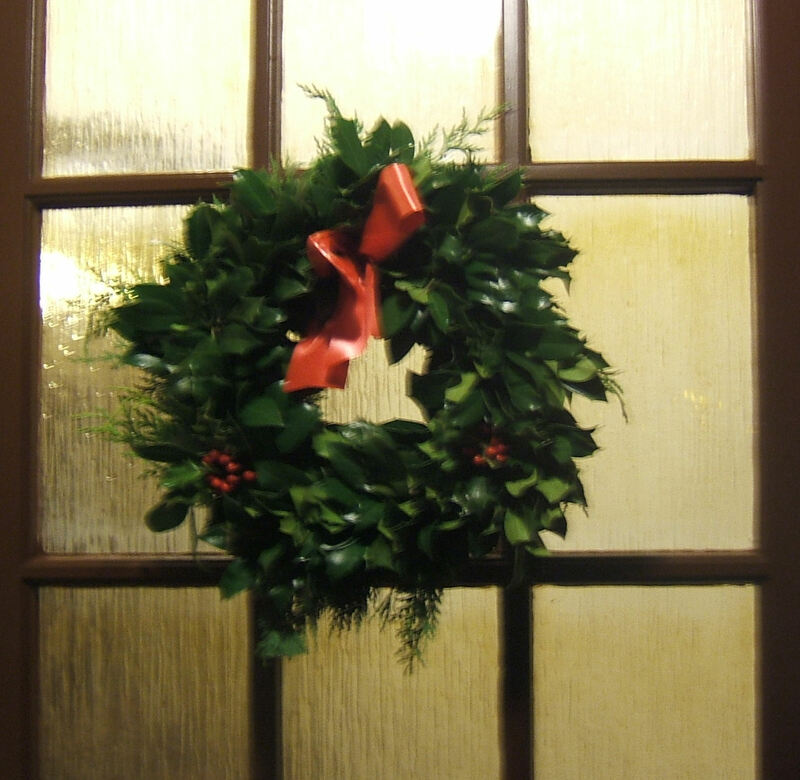 There should be no way that she can get near the holly wreath on the front door and we don’t have Mistletoe. Hopefully everything should be safe for our puppy’s first Christmas. I hope you keep yours is safe too. As winter approaches, thoughts move to tidying up in the garden. Thankfully, the garden hasn’t yet totally succumbed to the weather. The problem is that I am not allowed to do anything that would aggravate my hernia. Lifting and gardening are out of the question at the moment. Hopefully I should have an operation in a couple of weeks and then I can get back to normal, but for now I can’t even sweep the paths. So, my thoughts must turn to plans for the garden. I have a beautiful willow that I have always planned to pollard. Pollarding is a very useful technique for keeping trees of a size suitable for their surroundings. Tree roots will only grow as large as the canopy that they need to support, so there will be less chance of the roots having any impact on surrounding buildings. An additional benefit from my perspective is that after a few years of being pollarded, the tree trunk takes on additional character even when it is not in leaf. 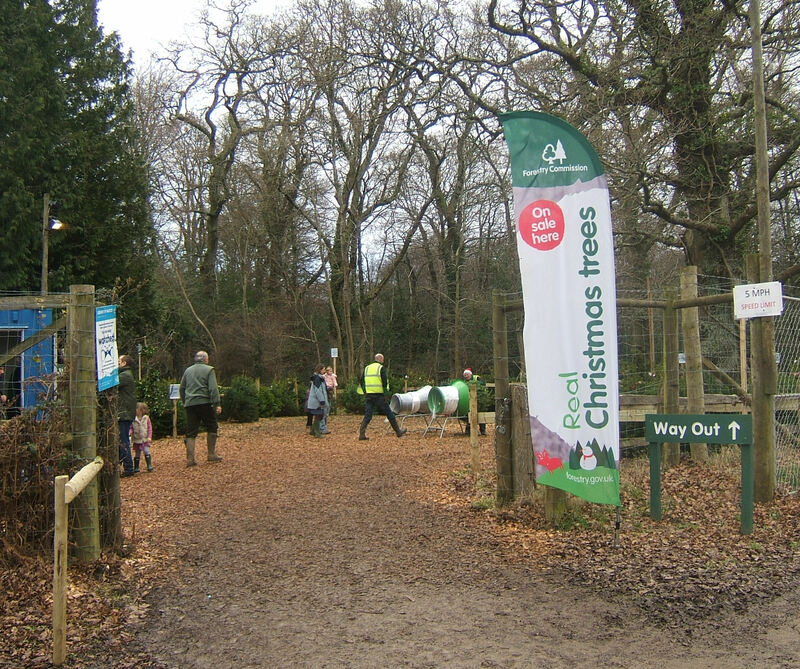 The downside may be that there is not very much leaf next year – we will have to wait and see how the tree takes to the process. The trouble is that there are a couple fairly substantial branches that leave the main trunk a little too low and I am not sure which ones should be totally removed and where to start the pollarding. While I am happy to do the actual work myself, my current plan is to find a tree surgeon who will give me the advice (for a fee of course) without necessarily having the job of doing the work. For those of you who have wisteria, the winter prune should be done when the plant is dormant. I try to do the job on 1 Jan or as close to that date as the weather conditions and work commitments allow. I plan to video the process this year so that you can see where to prune and how much neater the plant looks when this year’s growth has been tidied up. The added benefit of the winter pruning is that you will get even more flowers come the spring. The roses are another group of plants that you need to think about pruning. This is a good time to tidy up young roses that have not yet established a good root system. I leave the main pruning until the spring. 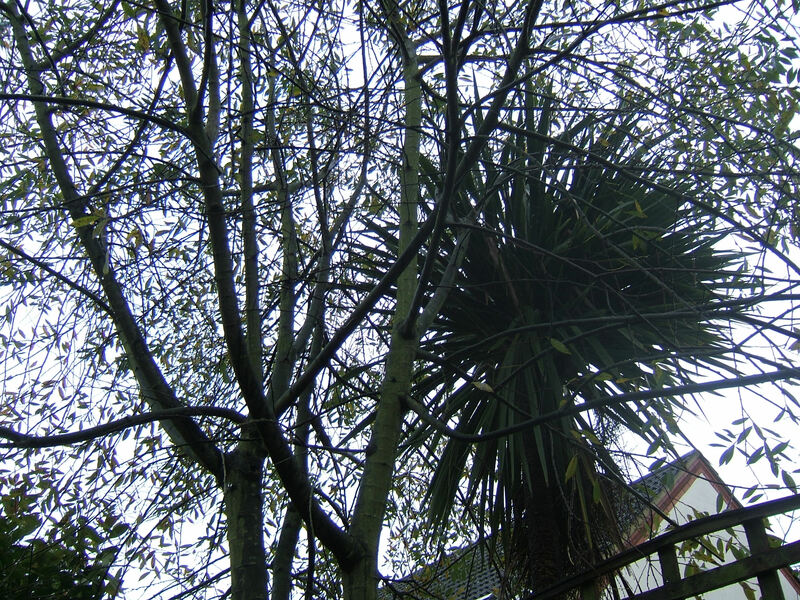 but where the plant has put on a lot of top growth, I shorten branches to half to two thirds of their height to reduce the impact of winter winds loosening them in the soil. The rest of my shrubs get their hair cut in the spring when I can see the impact of the winter on them. It seems a little non-productive to remove shoots that may survive the winter well and leave ones that might perish. 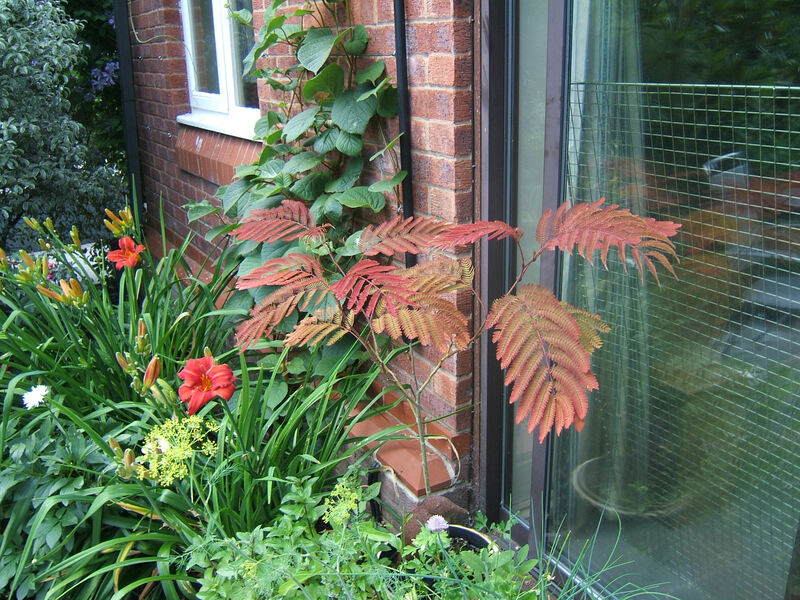 That said, I am very tempted to at least reduce the height of the cotinus that I have in front of the kitchen window. I love the way it acts as a vegetative curtain, far enough from the window to let in light, but still screening us from neighbours. However it is a little disconcerting when the plant reaches the height of the bedroom window. Last year, my friend gave me what looked like a twig in a pot for my birthday. Since she is a good friend, I knew it wasn’t a joke – but she wouldn’t tell me what it was until it started to show signs of life. 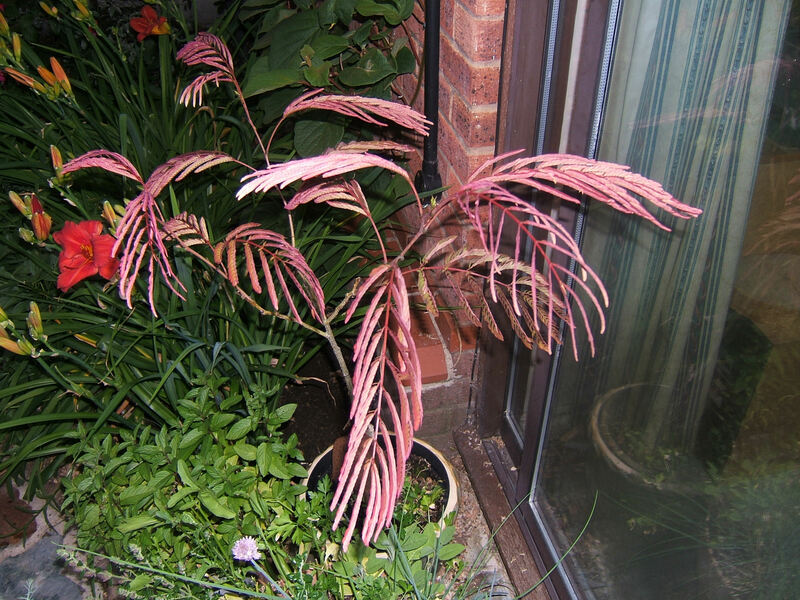 Eventually, she gave me its name – Albizia summer chocolate. Whilst being part of the mimosa family, it appears to be very happy in its pot. It is in a south-facing location which seems to suit it perfectly. The leaves are a lovely reddish colour.